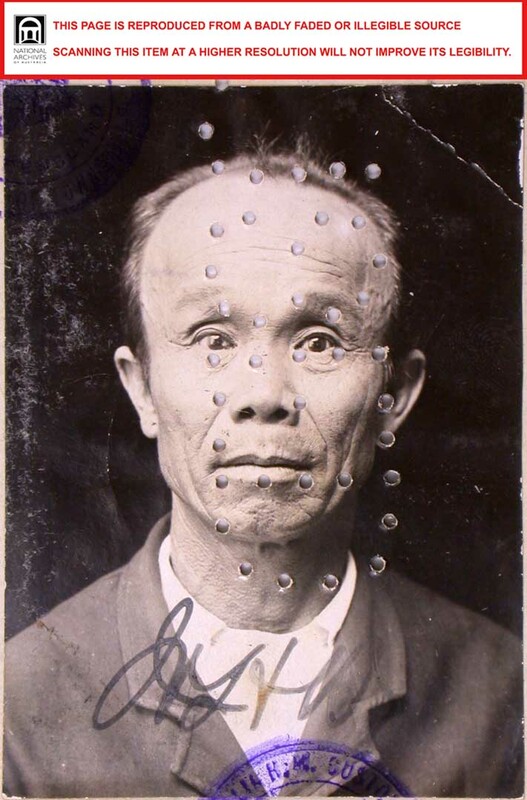 Faces of Chinese who applied to visit China during the first two decades of the Commonwealth, after arriving in Queensland as young men. Only listed is their occupation at the time of approval. Ah Lipp was born in 1840 in Canton and arrived in Sydney when he was 18. After spending 4 years workng in NSW, he travelled to Bendigo where he worked in the mines. He later became a market gardener in Malmsbury where he worked for 40 years This photo was taken when he was 75 before he returned home. 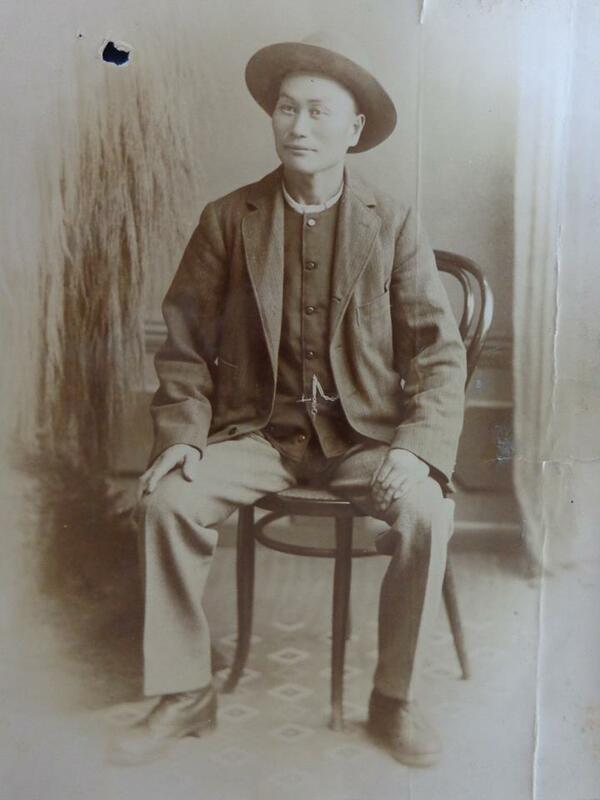 Yip Hoy was about 58 when he was photographed in the gold town of Croydon Queensland in1900. He came to the colony in1874 with his two brothers, married and ran a family bakery near Cooktown before operating one in the Croydon township. His wife Ah How, after giving birth to 7 childre, died of a miscarriage in 1904. He retired to Normanton where he was a silent partner in a butcher shop and died in Toowoomba in1932. 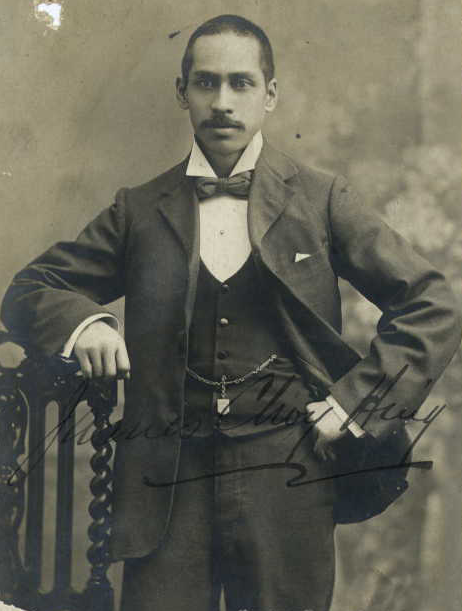 Loo Hoy had a varied and in many ways a typical working history for a 19th Century Chinese working class migrant. He was born in Canton in 1863 and arrived here aged 14. He worked 4 years in Emmaville, NSW and 10 years over the border in Tingha, Queensland as a tin miner. His contract rural labouring included ringbarking and pear cutting. His last job was that of a prickly pear cutter on a station at Goonawindi before he left for China in 1919 at the age of 56. Ah Ming had a typical lower middle class rise. Starting off as a gardener, he became a vegetable and fruit hawker and then a green grocer. He arrived in the NSW Colony in 1875 and worked for 6 years in Botany and Waterloo before returning to Canton for a year between 1881 and 1882. Returned to work in Botany for 4 years, then Burwood 1, Parramatta 3 Balmain 1 and Sydney for 4. 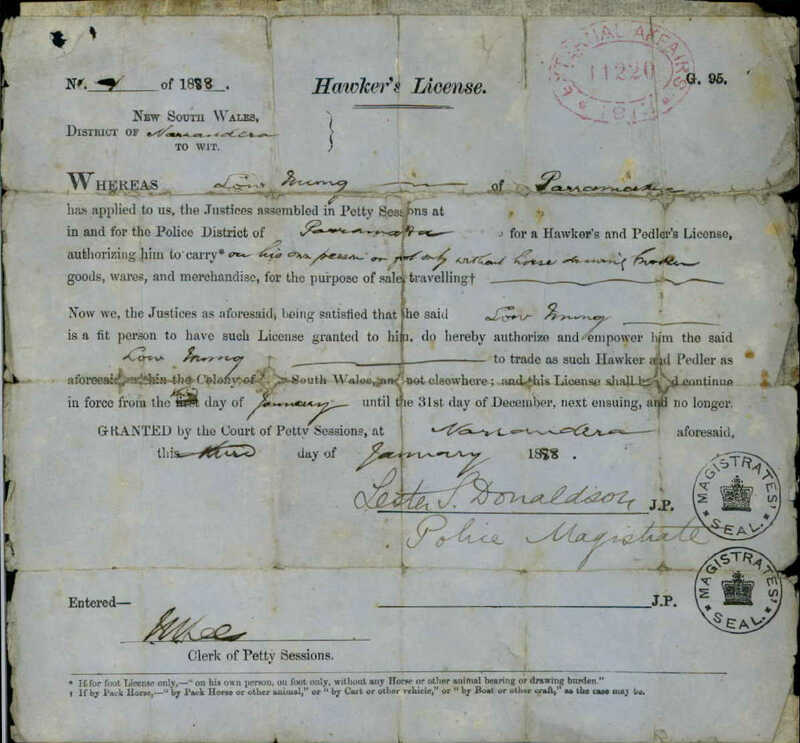 Moved to country NSW, Crookwell 3 and Nowra 2 before returning to Canton for 13 years from 1900. Returned June 1913 to work in Harden for 3 years before again returning home. Dealer and fruit hawker at Crookwell for a few years and then a hawker of drapery and fancy goods to towns in the country. Could write and express himself well in English. Mainly Chinese who applied to visit China during the first three decades of the Commonwealth, after arriving in the Northern Territory as young men. Their various occupations and the places they worked are shown. He arrived in Australia in 1856-7 and settled in Eaglehawk where he was the mining manger in a firm that extracted gold from tailings using cyanide. He employed about 70 men in his firm. 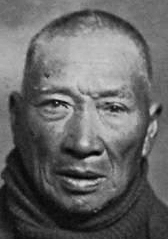 Market gardener and former miner Charlie Ah Lipp poses heroically for his portrait in 1915, unaware he is the earliest Chinese worker whose photograph exists in the National Archives. 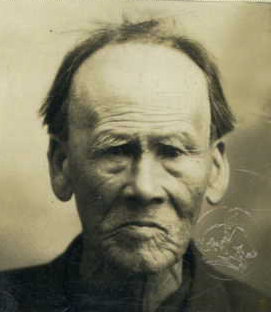 As an eighteen year old, he left from busy Hong Kong harbour in 1858. 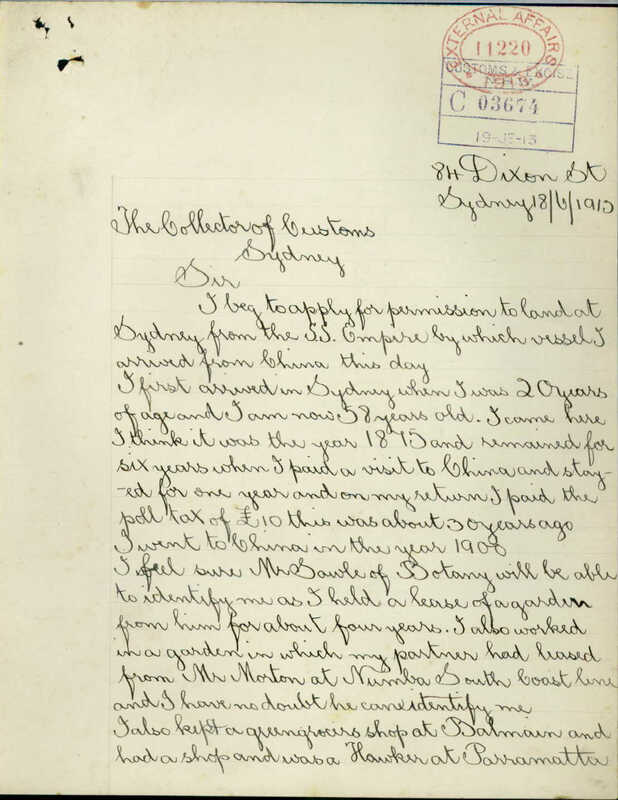 After a short stay in Sydney, he joined the Chinese diggers at Beechworth for 6 months. He worked in country N.S.W. for 3 years, then made his way to the diggings in Bendigo for 5 years. 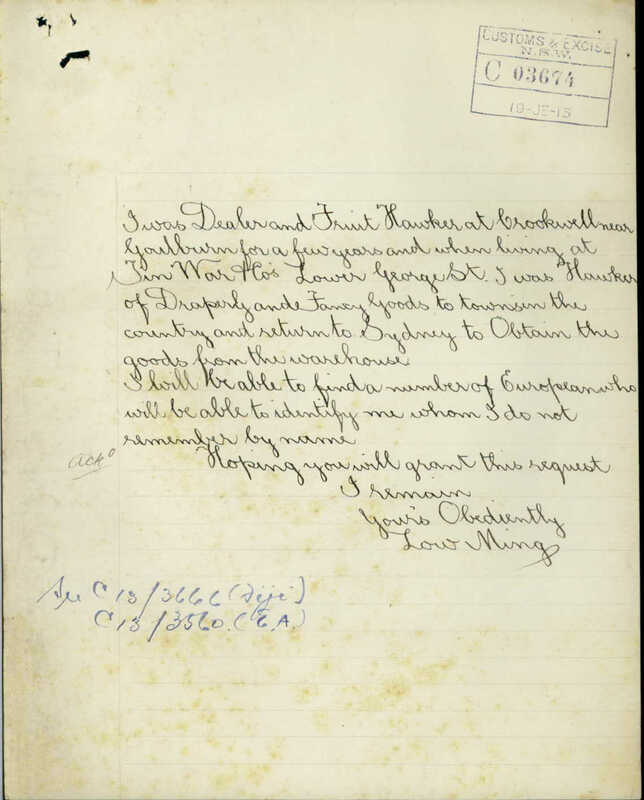 He continued mining in Castlemaine and finally settled in Malmsbury where he resumed mining. In 1883 when 43, he married Mary Louisa Downey in Castlemaine and was nationalised in 1885. On Tuesday Ah Lip, a well known resident of Malmsbury, came to Kyneton, and overstepped the bounds of temperance to such an extent that he became hopelessly drunk and took up a position in front of the Drill Hall in Market St, his legs outstretched across the path, while the wall of the building acted as a fortification for his back. Curiously enough, recruiting operations were going on in the hall and it was thought by some that Ah Lip was awaiting his turn for enlistment. Several friendly passers-by endeavoured to dislodge him from his entrenchment but he refused to budge, and stoutly held the fort until the arrival of Constable Philips, who promptly took him prisioner and had to procure a cab to convey him to the lockup. Later in the afternoon he was released on bail to appear before the court yesterday morning.."
"Ah Lipp grew and sold vegetables. He had his vegetable garden in the edge of the racecourse. He wore a flat straw hat and carried his produce in two large baskets suspended from long poles across his shoulders. Prices were cheap - 1d. for root vegetables, 1d. and 2d. for cabbages..."